Sometimes I wish a day had at least thirty-two hours. So much music, so little time, as they say. Thus it happened that it’s been almost two weeks since Funky Czech-in was “on tour” in Madrid, Spain, and so this post is not exactly hot news anymore. 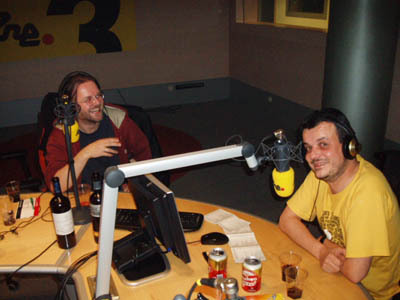 Anyway: thanks to Iñigo of Vampisoul we were guests on Charlie Faber’s insane radio show Sateli 3 live on Radio 3. The house was smokin’ and the receivers were explodin’ all over Iberia while we were airing hottest Czechoslovak bigbít from the sixties and the seventies! Only the best tracks were played, including some stuff that you already know from here. I hope to get the recording of the show soon to post it here as an MP3 stream. In the meantime tune into Sateli 3 live every evening from monday to friday, 9 to 10 pm CET. And while you’re already surfing, you may want to check out the nicely retro-designed funky site of Charlie’s friends at www.canora.es. Thanks for mentioning Canora in this nice blog of yours. Hope to see you back in Madrid sometime soon.